Technology: Heat Treating Services encompass a variety of procedures for heating and cooling materials without melting to induce certain properties or characteristics in them. Among the desirable outcomes of heat treating are hardening, improved dimensional stability,improved formability,improved machinability, softening,strengthening, and stress relieving. Plastic deformation may be included in the sequence of heating and cooling steps, thus defining a thermomechanical treatment. 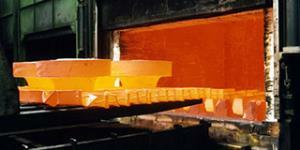 All metals and alloys in common use are heat-treated at some stage during processing. Iron alloys respond to heat treatment in a unique way because of the multitude of phase changes which can be induced through the various processes. Advantages: Heat treating services can alleviate the need to maintain facilities and personnel in house. Applications: Heat treating services can be used for small lot single time applications or can be regularly scheduled as routine production runs.